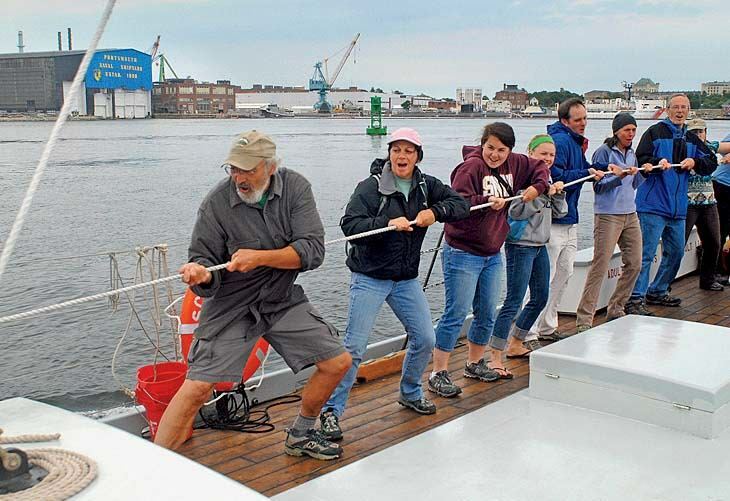 Scenic trips along the Piscataqua River highlight the region’s ecology and maritime history—along with the beauty of sailing. Crews enjoy a day out on the gundalow. The early gundalows (possibly named for the Venetian “gondola,” Bolster says) were powered by poles and long sweeps (oars), but by the 1800s the boats resembled the Piscataqua, which has a full deck, a cabin, and a lateen sail easily lowered to pass under bridges. By then, too, they were carrying commercial loads of up to 50 tons: raw cotton and spices were brought in, while fresh produce, fish, oysters, salt-marsh hay, coal, and “finished goods,” such as bricks, granite, and cordwood, Bolster says, were transferred out to ocean-worthy schooners bound for burgeoning metropolises like Boston.